Elvis might well have left the building around 30 years ago, but his merchandising bandwagon is still going strong. 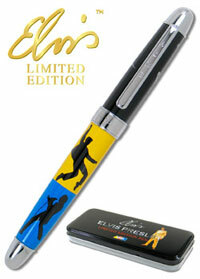 This limited On Stage Elvis Presley pen is available as an edition of 1935 worldwide. It’s a roller ball pen, featuring an Elvis silhouette and delivered in an Elvis box. Just the right side of cheesy and available for $95 online (around £48).